After a busy summer putting this new squad together TSK U14’s Boys welcomed Surrey Rams to St Mary’s in what ended up to be a closely fought game. TSK named a full roster of 12 players although unfortunately two we’re unable to be named due to FIBA clearance, and 11 of these boys were making their TSK National League debut. With only 5 team sessions prior to the game under new Head Coach Drew Sewell the boys looked pretty nervous prior to the whistle but it wasn’t long into the opening minutes when the first basket was scored that they slowly became a lot more confident of themselves and their teams capabilities. TSK definitely had the better start of the two teams and a few flowing moves saw buckets from Captain Will Latter and the talented Tarun Takir get them off to an early lead. The experience shown on the court from the skipper was evident throughout and not only in his ball handling and penetrations to the basket but also from his shooting from range with four 3 balls in the first half. 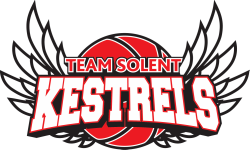 Former Solent Stars American ‘Coach Drew‘ also gave the boys some experienced and reassuring guidance from the sidelines and he’d of been very happy with the half time score in what was also his debut with TSK. The second half was slightly more nerving and Surrey got back into the game and tied it up twice largely through some strong individual play from former TSK junior Orson Barrett Berry. Credit to the boys though as they never went behind in the game and they always managed to find another gear when it mattered and Latter & Takir continued to trade baskets along with some important points from Owen McIntee, Harry Lemmon which helped TSK to a 10 point win and an impressive result in their first game together. Captain Will Latter lead from the front and finished with an impressive 42 points. The focus now turns to our next match up against London Lewisham Thunder on Saturday which is AWAY with a 2pm tip. Good luck boys!